Nominated for seven Academy Awards - including Best Picture - and Winner of three, this beloved classic comes to Blu-ray for the first time. In the role he was born to play, Oscar Winner Anthony Quinn lights up the screen as Zorba, the lovable rogue with an insatiable lust for life. 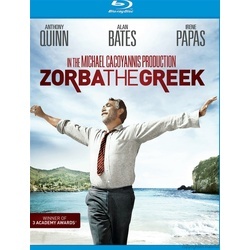 When shy Englishman, Basil (Alan Bates), lands on the Isle of Crete seeking his fortune, Zorba sets out to teach him the ways of the world... Zorba's world. Through it all, Basil learns there's only one way to deal with life's triumphs and tragedies - never stop dancing!